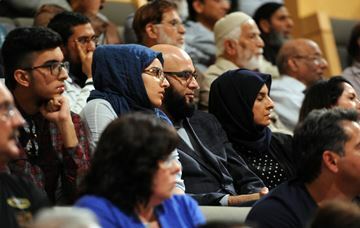 A Planning & Development Committee meeting concerning a planned Meadowvale Islamic Centre filled Mississauga’s Council Chambers and four committee rooms of overflow space as proponents and residents concerned about traffic and parking made their case. After 13 years of controversy and four hours of public discussion, City Council approved an application to build an Islamic centre in Meadowvale. The decision was met with a mixed response of applause and shouts of “shame” following hours of emotional debate at Monday’s marathon meeting. Crombie asked former mayoral candidate Kevin Johnston to return to the podium after he raised concerns about traffic congestion and noise. The mayor asked him if he is the author of the Stop the Mosque pamphlets and website, to which he replied yes. Johnston said he does believe that but was not at the meeting to discuss those points. Crombie then asked residents if this is what they believe in and are applauding. Some in the gallery responded with applause. A steady stream of residents marched up to the podium in Council Chambers at City Hall to raise their concerns about the proposed mosque, including increased traffic causing safety concerns, not enough parking, that the building is too large and that it doesn’t fit in with the surrounding community. The meeting was so well-attended that there wasn’t enough room in Council Chambers so people were sent to one of several committee rooms to watch the proceedings on television. The audience heard at last night’s (Monday, Sept. 21) meeting that several changes have been made to the project to address community concerns. The height of the building’s minaret has been reduced from 27 metres to just less than 20 metres and the height of the dome has been reduced to about 15 metres from the 18.6 metres first proposed. The two-storey building will be 9.5 metres tall, not counting the minaret and dome. Staff have determined there will be no shadowing from the dome or minaret on neighbouring buildings. Increased traffic is one of the most frequent concerns from those against the project use when speaking against it. However, according to staff, “significant” traffic isn’t anticipated and that Winston Churchill Boulevard should be able to accommodate the cars heading into and out of the centre. Parking, or a lack thereof at the site, was also raised numerous times by residents as a reason to turn down the application. However, the centre will have 115 parking spaces, one more than what’s required by the municipality. Staff did determine that, during peak periods on Friday afternoon for prayer sessions, the demand may outnumber the available parking spots. Peak parking demand is usually for about 30 minutes on Friday afternoons. A few ways to solve the issue were proposed in the report, including on-street parking, increasing the number of prayer sessions and sharing parking with another nearby facility, among others. Glen Broll, a partner with Glen Schnarr and Associates, the legal representation for the Islamic centre, told councillors that his clients have entered into an agreement with the nearby Meadowvale West Church Centre to accommodate the overflow parking. The location of the proposed centre, near homes, isn’t out of the ordinary, according to the report. Saito tabled an alternate recommendation that called for the application to be refused but she found little support for it amongst her colleagues as she cast the lone vote in support of it. The councillor, who earlier this month had sent out an email newsletter to her constituents where she said it appeared likely that the application would be approved, asked Amir Syed – the Islamic centre’s board of directors president – point blank if he would be willing to once again try and work with her and the community to alleviate their concerns. Syed replied that, after waiting 13 years for the building, it was time to move forward. He told the committee they have tried to find another location but that wasn’t successful. Islamic centre officials have previously told The News the organization has been forced to rent space in Mississauga to host their prayer and religious services or if they wish to have classes or activities for their members. They want to build the centre so there will be a location in Meadowvale for their community to use. Meadowvale resident Cheryl Pounder, who has bordering on tears when it was her turn to speak, begged the councillors to not approve the project. “We can live in harmony but it’s just not the right location,” said Pounder.